We have created a video game called, Age of Yasuní, in which we basically present the conflict that original peoples have with the petroleum activity in a range of cases (Yasuní, in the Amazon, the Niger Delta of Africa, Southeast Asia, Alaska, and the North Sea). If you can prevent the construction of the oil well you win, but if you can’t get the oil companies out of your territory, you lose. The game is simple, appropriate for all ages and for a broad public with little knowledge of these issues. The game is already in the Appstore and on Google Play and we will soon release a PC and Linux version on our websites. There is a free version and a paid on ($0.99 or the equivalent in Euros). Proceeds from the paid version ($0.99) will support community-led efforts around the world to keep the oil and gas development off of their lands. 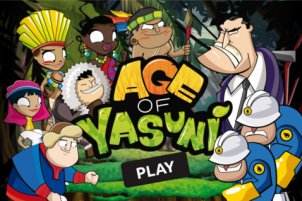 The mobile videogame, Age of Yasuní is now available for download. This is an effort to draw attention to the plight of indigenous peoples and the threat of oil to their fragile and biodiverse territories around the planet. From the game you can learn, What is Yasuní? Why defend it? What are the threats caused by the expansion of the oil frontier? We would like to invite you to be part of a global effort to publicize this initiative among your friends, network lists and in your web pages, and help us get the word out electronically so that people will download the game from the Appstore and Google Play.